This recipe starts in the blender or food processor and finishes in a mixing bowl. Altogether it takes less than 20 minutes and is a recipe that makes very little mess (a.k.a. my kind of recipe). Pop it all into your blender or food processor, add chocolate chips, bake for 10 minutes and voilà! Couldn’t be easier! 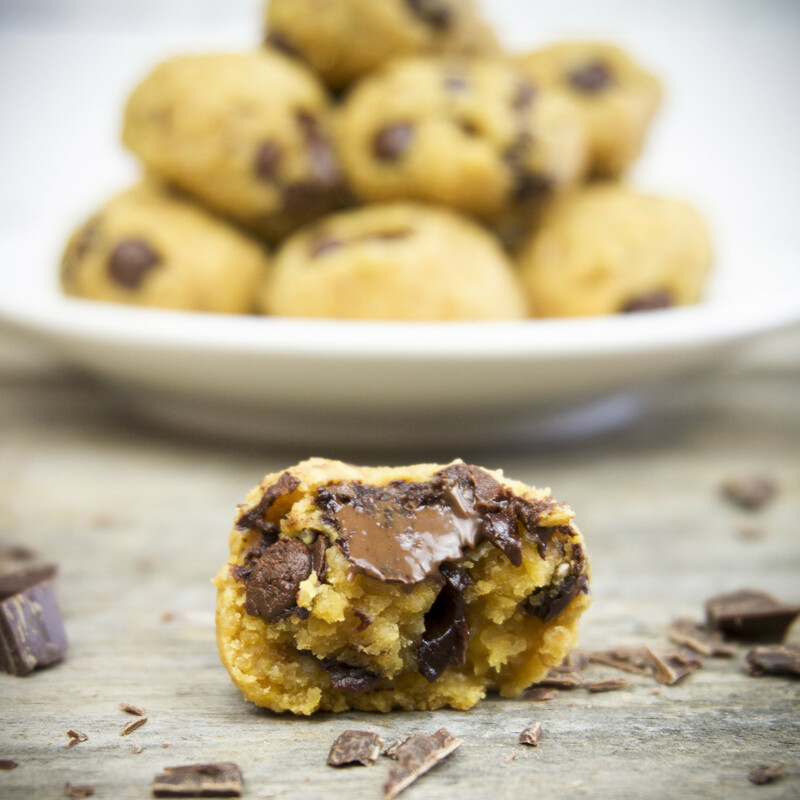 Now what’s the secret to the awesome texture and taste of these Chocolate Chip Cookie Bites? Who would have thought that they’re not only super healthy but also give an amazing texture for baking cookies & cakes? That’s one of the many things I love about experimenting with plant-based food, you’ll never get bored and keep on being surprised about the many possibilities out there. 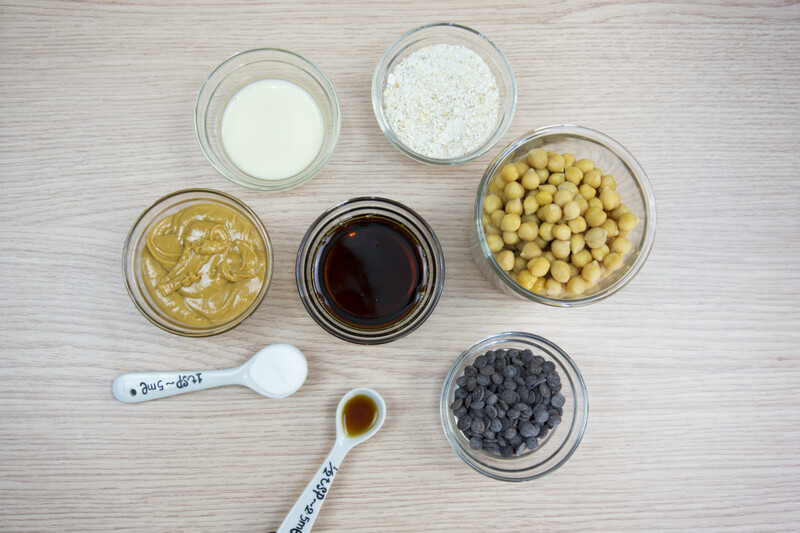 I absolutely love sneaking beans into my vegan desserts, as they not only give an amazing texture but are also SO healthy and a powerhouse of nutrients (protein, iron, etc.). As you know I’m all about natural and minimally processed ingredients, so I used homemade peanut butter in my recipe. Ever since I got my new Optimum blender, making nut butters literally takes 3 minutes and I feel like I’ve entered a whole new sphere of plant-based home cooking/baking. The only two ingredients I used are roasted peanuts and a tiny bit of Himalayan salt. If you don’t have a good blender yet (having one will change your life though, just sayin’), use store-bought natural peanut butter from good brands like Whole Earth. You want to have the least amount of ingredients as possible. Optimally, only peanuts and maybe salt. No added sugars, no preservatives, etc. 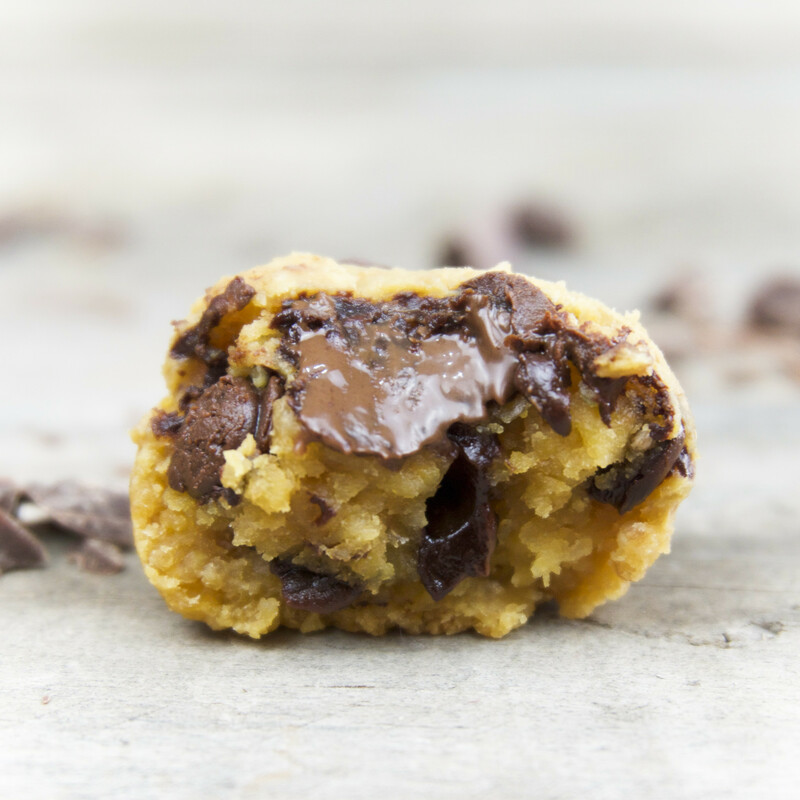 If you decide to give these delicious Chocolate Chip Cookie Bites a try, let me know! Leave a comment and rate it – it’s so helpful to me and other readers. And don’t forget to take a picture and tag it #thetastyk on Instagram! I love seeing what you come up with. Cheers and enjoy! 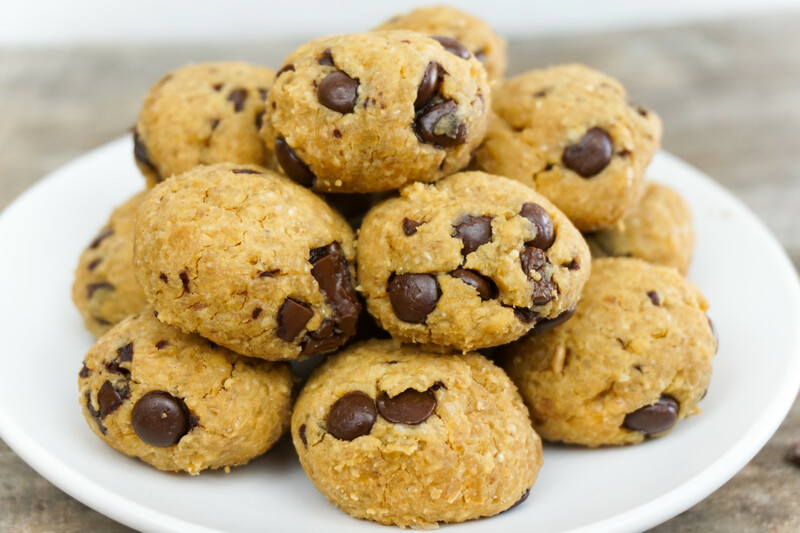 Healthy Chocolate Chip Cookie Bites? Yes, it is possible! Believe me, you won't be wanting any other cookies after you've tried these. These little bundles of joy have a soft core with melted chocolate and a slightly crunchy outside - so good! Preheat the oven to 180°C/ 350°C and line a baking tray with parchment paper. Place the first 7 ingredients in your high-speed blender/ food processor and use the blender stick to mash them down until you have a more or less smooth batter (it's ok if there are still a few chickpea pieces left). Place the batter in a bowl, add in the chocolate chips and combine with a spatula. Use your hands to form small bite-sized balls and place on the baking tray. Place the tray in the oven and bake for 10-15 minutes. Enjoy warm or store in air-tight container for a week! For more delicious and healthy recipes like these Chocolate Chip Cookie Bites, check out my Raspberry Vanilla Cheesecake or my Coconut Tapioca Pudding. Looks delicious. Do you drain the chickpeas or not? Thanks! Thank you! I wasn’t sure since aquafaba is all the rage right now in vegan baking. Yes. I also reserved the chick pea juices and made an aquafaba chocolate drink out of it. Delish! One more question – can you substitute another type of gluten-free flour for the oat flour (my daughter is allergic to oats)? Perhaps coconut flour or almond flour? Thanks! Made these last night and they were SO GOOD. I made them with a friend and we ate the entire batch. We didn’t feel that guilty about it either! I didn’t have oat flour or oatmeal, so used a mix of white whole wheat flour and all-purpose flour instead, and they still came out delicious — the only thing was they came out really sticky, but that was fine; once they were baked, you couldn’t tell that it was a problem. I definitely will be making these again in the future! Is there any chance I could make the batter and store half of it for later in the refrigerator or something? I really want to eat them warm, but there’s no way I can eat an entire batch myself! I never tried that! 🙂 but maybe either store it in the refrigerator for 1 day, or if you want it for longer put it into the freezer, and before shaping them let them defrost! Hi, what would you substitute the peanut butter with for those with peanut allergies? Hi Kirsten, thanks so much for a brilliant recipe. I made these exactly as you suggested and thankfully I took some photos as they all seem to have disappeared! I love the hint of peanut butter which tones down the chick pea flavour. Hello. I am really interested in making this or something similar. I need nut-free recipes for school – total nut ban on all food taken to school. Could you suggest another option for the peanut butter? What function does it in the recipe? Would tahini work? Try sunflower seed butter or tahini 🙂 It add moisture and fluffiness to the cookies! Hi, it’s probably a stupid question but when you say 15oz for the chick peas, is it before or after it was drained ? These are the best bean cookies I’ve eaten so far. The dough is to die for. Problem with the cookie is the peanut butter gets lost with baking and I’m throwing around some ideas to bump up that flavor; PB powder in place of some of the oat flour, maybe, or maybe I can just add more PB. The dough was really sticky so I just spooned it on to the parchment then oiled my hand and flattened to cookie size…more than the picture. I am always looking for bean baked goods so I can eat them anytime, like for breakfast! Thanks. I just made three batches of these for a friend to take to her boot camp patrons. (Confession, I did not use vegan chocolate chips!) These are amazing! We figured out a small ball scoop was the best tool for ease and uniformity. And I retained the chickpea liquid and tried some aquafaba recipes. I am now a hug fan of that, as well! Oh yay! 🙂 So happy you like them! To be honest these cookies are one of my absolute favorites, too! I make them at least once every 1-2 weeks because my boyfriend LOVES them 🙂 I’m gonna start experimenting more with aquafaba soon! Being Italian we grew up with chickpeas/chestnuts in sweets… your recipe states a 15oz can chickpeas. Is that the 400g can? Also, did you make your own oat flour? Well hello Tasty K ! Since I don’t eat any corn products or refined sugar at all, I modified the recipe. I made them with of course chick peas and baking powder and then it went crazy from there. I added date syrup, espresso, banana, coconut flour, eggs (ooh… not vegan! ), hazelnuts, cashew butter and raw chocolate (100% cocoa, no sugar). I left out almond milk, the dough didn’t need more liquid, and I also left out peanut butter, vanilla and maple syrup. THEY ARE GOOD !!! YUM ! Wow! 😀 Well that’s definitely experimental! 🙂 But amazing that they turned out great! I love recipes where there’s tons of freedom to adjust things and this is definitely one of them! Is that normal that it’s difficult makin the bite because it is too sticky?